In the current economic climate, businesses of all sizes are routinely expected to do more with less. Eliminating waste, efficiency improvements and enhancing value for the customer can all help you transform your business. Lean is a methodology that has evolved over centuries, from before the industrial age, through the early 1900’s and the mass manufacturing of cars, to healthcare and e-commerce in our present digital age. However, while the principles undoubtedly have strong roots in manufacturing, they are just as relevant in the context of service delivery. There is much more to ‘Lean’ than the name implies. When applied wholeheartedly, it's a mindset which unlocks the ability to engage and motivate teams, provide continuous improvement and deliver increased value to your customers, all necessary to realise seamless customer journeys and continued growth. 2. Identify the value stream and eliminate waste. This is specified from the standpoint of your customer. We live in an age of empowerment, where customers can easily compare against other offerings, often competitors. A good rule of thumb here is to ask; if your product or service was broken down into each component part, would they be happy to pay for it? Either negative experiences or non-value-adding elements can easily cause inefficiency, unnecessary bloat, and in some cases lead your customer to explore other options, often competitors. Aligning with your customers early on ensures every deliverable carries value. Traditionally, the value stream began at the moment where a customer raises an order and is completed when payment is taken. In the digital era, this stream can begin much earlier in the customer journey and continues with the ongoing relationship and experience. Understanding every touchpoint is crucial to understanding how you can add value to your work. Ideally, you should be able to map any product or service and follow its path from beginning to end. Every customer touchpoint needs to be visited to identify which non-value-adding activities can be removed from your end-to-end process. The ability to prevent wasting your customer’s time, as well as the internal waste, will quickly prove to be invaluable. There are few words more harmful to an organisation than “we have always done it this way.” Leaders need to delve deep and question all internal processes and learn to think beyond a functional or departmental way of doing things. Silos should be removed to enable work to flow smoothly through every team and department with a similar, achievable workload throughout every day of the year. Every product or service, from conception to completion should be carefully examined to allow the process to flow continuously, like a river. When obstacles have been removed, you should be left with a step by step value-adding process, without any interruption. It wasn’t too long ago that over half of the books printed in the USA were regularly pulped because the supply chain failed to measure the customer demand for new books accurately. Today, many books purchased through retailers like Amazon, only exist as soft copies; printed on demand upon purchase. 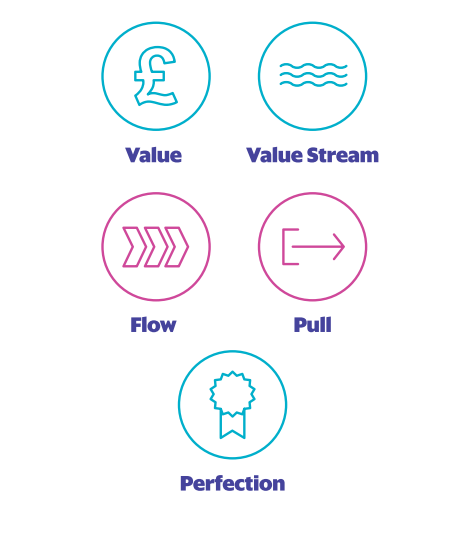 Pull states that no-one ‘upstream’ should make something until the ‘downstream’ customer asks for it. The act of creating flow and pull allows businesses to respond faster and more accurately, but with less effort and work. Many frequently fall into the trap of rushing in to push work into the process as soon as possible, to increase output. However, the Lean methodology delivers productivity through controlling and often slowing the release of work into that process. The first four steps are the tools you need to embark on a journey of continuous improvement and greater transparency. The road to perfection involves continually analysing, measuring, tweaking and making things better - all the time - for your customer. Only by creating a company-wide culture of constant change and improvement will you be able to produce better quality products, at a lower cost, that is also delivered on time. How Does Lean Impact the Service Industry? Customers expect more. Overall experience is just as valuable as the end product or service purchased, with many even willing to pay more for increased value. Approximately 65 million customers worldwide using Amazon's Prime subscription service, enabling faster delivery and increased support, serves as an excellent example of how consumers are flocking to services that deliver superior experiences, and more importantly, are willing to pay extra for it. The service industry must evolve to meet growing levels of customer demand, which is only further highlighted by new, digitally savvy organisations disrupting markets and delivering smoother customer journeys, in many sectors, established players are finding themselves competing, not with similarly sized players, but smaller, nimbler entrants. By applying Lean, businesses are enabled to deliver outstanding service and long-term business success. Critically, the Lean principles also recognise the critical role highly motivated teams play in achieving change and ongoing improvement. Understanding the basic principles of Lean is not enough on its own to progress forward. To be truly effective, service organisations must also understand the need for different management techniques when processing high discretion work common in the service industry, also known as the Lean Continuum. Organisations will also need to undergo a culture transformation to ensure that all employees strive towards perfection with their customers’ needs being at the top of their agenda. Rather than blindly following a new set of processes, you need to transform your business into a learning organisation too. Our Lean Service training programme regularly welcomes individuals at all levels, providing practical, hands-on insight into the transformative benefits of the methodology, while equipping delegates with the tools to implement in the workplace. Stay informed. Don't miss our latest thinking.